This paper uses the World Input-Output Database (WIOD) to analyse changes of Europe’s position in global specialisation and location patterns of exporting activity within Europe by means of a number of competitiveness indicators. We consider both manufacturing as well as tradable services. 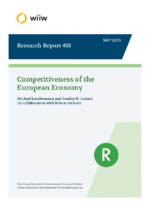 The study analyses the increasing role of services–industry linkages, the differentiation in specialisation and competitiveness patterns amongst groups of EU member countries pointing to the increasing concentration of manufacturing activity in the ‘Central European Manufacturing Core’ and to competitive weaknesses of some of the EU’s core economies as well as of some of the lower- and medium-income economies (‘Europe’s periphery’). We also undertake an econometric analysis of the determinants of a range of competitiveness indicators, including explanatory variables such as labour productivity, skill composition or labour compensation per employee as highlighted by traditional trade theories as well as domestic and foreign business services linkages or vertical cross-border production integration to account for phenomena which have come to shape the global trade landscape more recently.